Dry beans are easy to grow and can be stored after harvest for a healthy, delicious meal all winter long. There’s a lot of satisfaction in producing your own low-cost, vegetable-based protein on the farm. Combine beans with corn, rice, or other grains to make a complete protein. Beans are rich in B vitamins and folic acid, contain minerals including iron, selenium, potassium, magnesium and calcium, and are high in fiber. Plant beans after the last frost date in your area, and ideally, wait until the soil is well-warmed (70 to 90 degrees F). Beans should be direct seeded into the soil. Space seeds 1 1/2 inches apart. Space rows 14 to 36 inches apart depending on your equipment. If you are growing a small number of beans to hand-harvest, space rows closer together. If you are using a tractor, space 36 inches apart. Beans do best in moderately rich soil but they will thrive even in somewhat depleted soils, as they have the ability to fix their own nitrogen. Beans do not respond very well to added fertilizer. If your soil is acidic, add some lime before planting. If this is the first time you’re planting beans in this soil, make sure to coat your bean seed with inoculant, a specific species of Rhizobium that beans need for sprouting (you can get this from the seed company or farm store where you purchase your seed). Once in the soil, the inoculant will stay there and multiply almost indefinitely, so this is just a first-time planting task. Mulch during early growth to keep weeds down. Once plants are well-established, they are excellent at shading out weeds. Cutworms and root maggots sometimes attack seedlings. Thin plants to allow for good air circulation. Too much rain can lead to rusts, molds, and blights. Avoid working among wet plants. Turn under bean debris at the end of each season and practice crop rotation. If fall weather is very wet or if frost threatens the harvest, pull plants early and finish drying under cover, such as in a shed, barn or basement. 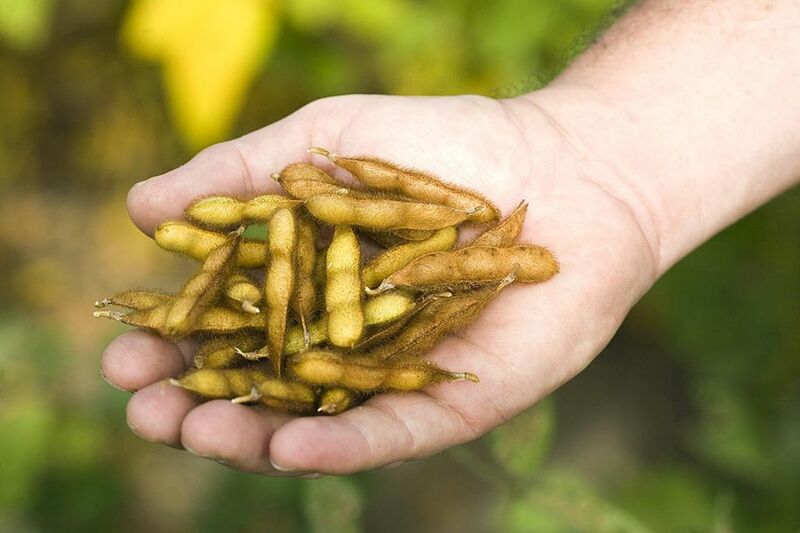 Beans will continue to mature in the pods even after they are picked, so don’t worry too much if you have to harvest immature beans. As tender annuals, beans are very sensitive to frost. Plant once you’re sure all danger of frost has passed, and harvest early if needed, as described above, to avoid frost damage in the fall. Beans are quite easy compared to other crops. Just weed, water and mulch as needed through the growing season. Beans are fairly drought tolerant, but you must make sure they have enough water while they are forming pods and seeds for a good harvest. Dry beans are harvested when they rattle in the pod. Pull up the plant by hand and hang from the roots. Traditionally, bean plants are lashed to a 5- to 7-foot high pole. You can harvest up to 5 acres of beans by hand but more than that will need specialized harvesting equipment for your tractor. Dry beans require threshing – getting the beans out of the pods. For small amounts, you can do this by hand by squeezing the pods open. A traditional method is to hold the plant by the roots and bang it against the inside of a barrel. For more than about a half-acre of beans, you might want to invest in threshing equipment. After threshing, beans must be cleaned and sorted. For small amounts, do this by hand, using a screen and a hair dryer to blow off debris (or an air compressor if you have it). Split beans can be fed to farm animals. For large bean harvests, you can buy a seed cleaner. If beans are soft (bite one and see), continue drying them until they feel firm to the bite before moving them to storage. Freezing beans before storage kills any potential insects such as the pesky bean weevil. Store dry beans in a dry, cool, airtight container away from sunlight. Beans are best used in the season after they have been harvested, but they will last for several seasons if needed. Beans are self-fertilizing, so you don’t have to space different varieties apart from each other. Just save your best and earliest-maturing seeds for next year.